Help! I stupidly deleted all 86 notes on my iPhone including all my reading records, random work ideas and even the measurements of my mom's garment. They are so important! Can anyone help me get them back? BTW, iOS 12 is running on my iPhone! Accidentally deleting Notes is actually very common, a problem that can lead to a lot of other problems especially when the notes carry important information. 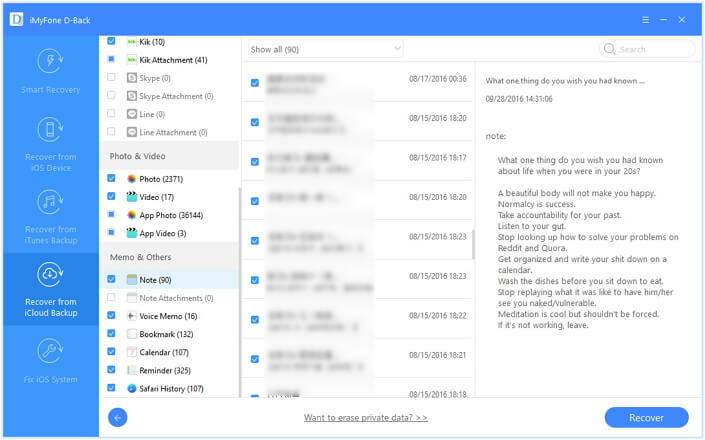 If you have lost some of your notes, this article will show you 4 ways to get them back whether you have a backup or not. And this article works with all iOS devices and iOS versions even you are using the latest iOS 12. Can I retrieve deleted notes on iPhone? The simple answer is a Yes. Why deleted notes can be recovered? Like other data, notes are saved on the SQLite database. When you manually or accidentally delete Notes, it only changes its storage slot from “Allocated” to “Unallocated”. The actual data is still in the database. When you use your phone and create new data, the entries in the “Unallocated” slot would be occupied first and new data will overwrite them. So you'd better stop using your device after deleting notes. Then all you need to do is to read the follwoing guide and choose one method you prefer according to different situations. If the notes are not in the "Recently Deleted" folder, iMyFone D-Back iPhone data recovery can help. 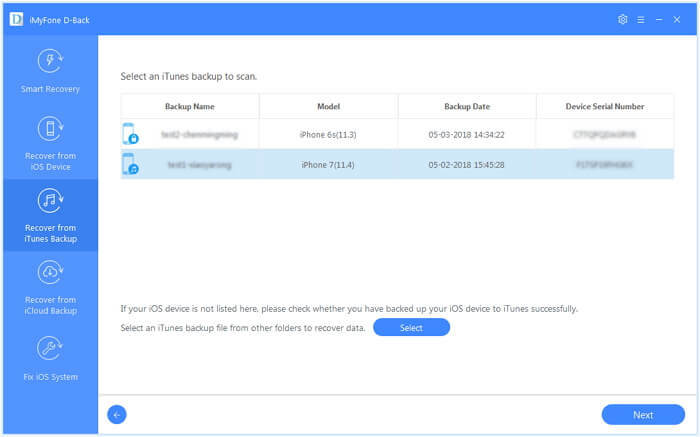 If you don't have a backup or don't want to restore the device from iTunes or iCloud (which will overwrite data on your device), then the program will help. The following are some of the tool's useful features. D-Back applies advanced technology to search for the deleted notes in the SQLite database in the most thorough way, which makes it the best notes recovery tool with the highest recovery rate in the market. It supports to recover deleted notes without backup. 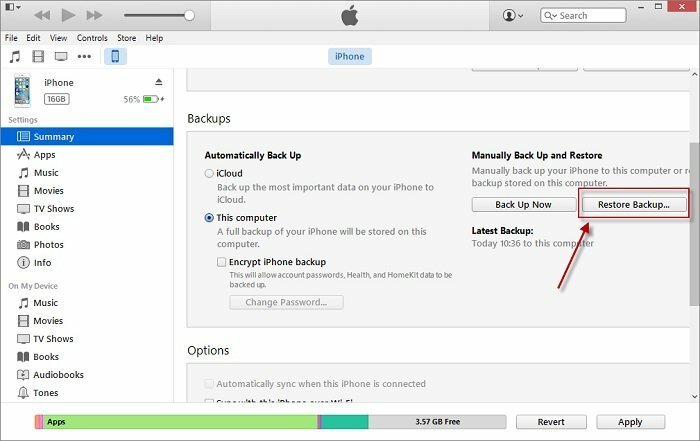 It supports to view the notes within iPhone backups which cannot be done with iTunes and iCloud. Viewing all the content of iTunes or iCloud backups before recovering or restoring means you will not restore a wrong backup with unneeded data. Extract and recover notes you need from iTunes or iCloud without having to restore the whole backup. If you do no have any backups, this is option is the best choice for you. Step 1.Choose the Recovery Mode: open iMyFone D-Back on your computer and connect your iPhone to the computer. Choose "Recover from iOS Device" from the 4 recovery modes. Step 2.Connect the iPhone to the computer using a USB cable and click "Next". Step 3.Choose the File Type: choose note in the file type list and click on "Scan" button. The program will start to scan the deleted notes on your iPhone. Step 4.Preview and Recover Deleted Notes: when the scan is complete, preview the Notes in the results page, and select the ones you want to recover. Click "Recover" to save them to your computer. iCloud and iTunes can back up not only your existing data, but also the deleted data on your device. But you cannot see or access the deleted data until you restore the backup. Here with the professional help of iMyFone D-Back, you are able to view both of the existing and deleted data within your iTunes and iCloud backup. It only works when you have made an available iTunes backup before. That means if you never use iTunes to back up device, you cannot restore via official iTunes. What's more, if the previous iTunes backup is corrupted, you cannot use it either. Official iTunes does not allow you to view its content, so you will not know whether it contains the notes you need until you perform the restore. Luckily iMyFone D-Back can completely overcome the shortcoming when you want to view and check whether an iTunes backup includes the needed notes. You can simply use it to extract them from the backup. Here's how. Step 1.Choose "Recover from iTunes backup". Click "Start". Then you will see all the iTunes backups on your computer. Choose an iTunes backup from those listed and then click "Next". Step 2.Select "Note" as the type of data to extract. Click "Scan" to allow the program to scan the selected backup file. Step 3.When the scan completes, all Notes will be displayed. Select the ones you need and click "Recover" to save them. You need make sure that you have backed up your notes successfully with iCloud before, because there are many factors like internet stability affecting the success of making an iCloud backup. You can rely on this way if you own an available iCloud backup. Here D-Back will help out, because it allows you to view your iCloud contents first. The steps to extract notes from iCloud backup using iMyFone D-Back are similar as to extract them from iTunes backup. Step 1.Lauch D-Back and select “Recover from iCloud Backup”. Then click Start button. 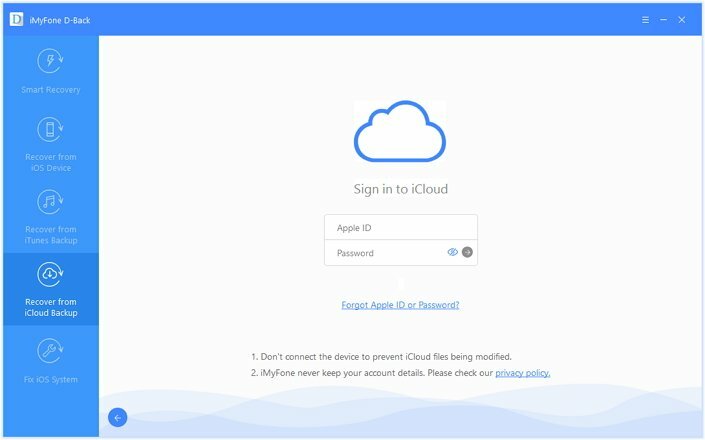 Sign in to your iCloud account using your Apple ID information. 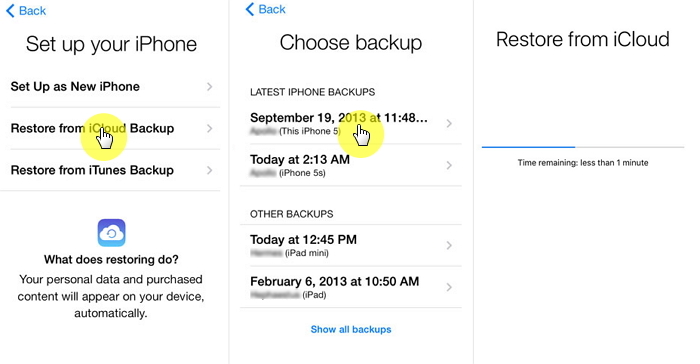 Step 2.All the iCloud backups will be shown. Choose the most relevant one and click “Next”. Step 3.Select “Note” from the list of data types shown and click “Scan” to continue. Step 4.All the Notes will appear when the scan is completed. You can select the notes you want to retrieve and then click “Recover”. The final step is to choose a folder for storing them. 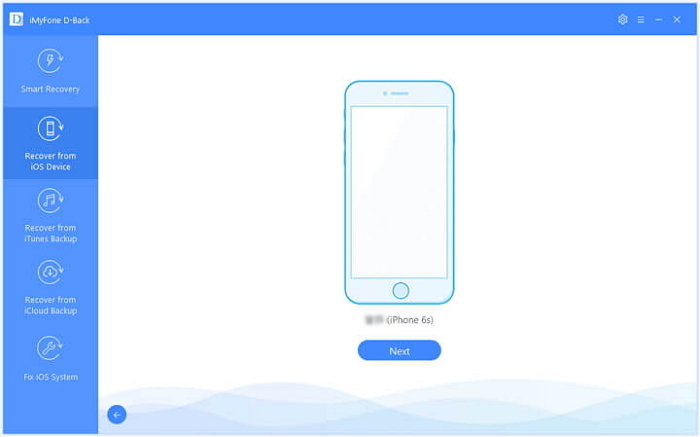 The free trial offers you a chance to test iMyFone D-Back iPhone data recovery's effectiveness, risk-free. The methods in this part are official and even they will make data loss of your current data, but we will simply describe them as alternatives to get old iPhone notes for you. If you regularly backup your iPhone data to iTunes, it is likely that your deleted Notes could be in your iTunes backups. Here's how to recover them from iTunes. Step 1: Connect the iPhone and Open iTunes on the computer you synced your device with. Step 2: Click "Restore Backup" to restore the device to the latest iTunes backup. Restoring the iTunes backup will overwrite the existing data on your iPhone. If you are not sure which iTunes backup contains the notes you need, we suggest you open and check all your iTunes backups via D-Back first, which will prevent unnecessary data loss after restoring. 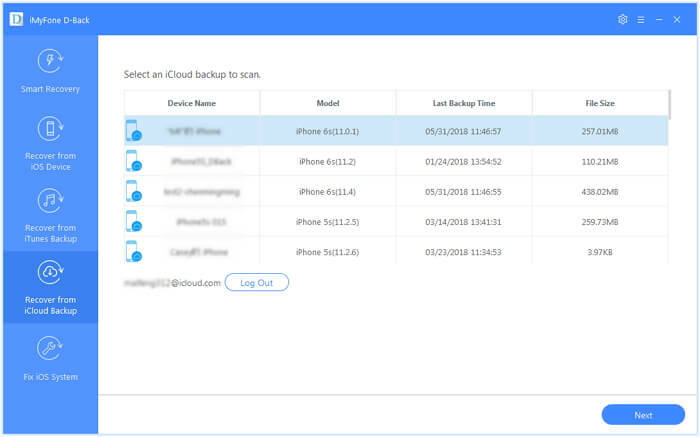 If you have turned on iCloud backups and satisfy the requirements for an automatic iCloud daily backup, your deleted Notes may be included on an iCloud backup file. If they are, all you have to do is restore the iCloud backup to get them back. Apple provides the instructions here. Before restoring iCloud backup, you must reset your device first, which means all your data and settings will be erased. So in order not to lose any other data, just try D-Back to view all the data within your iCloud backup. Have you made your decision on how to recover deleted notes from iPhone? If you still hesitate, you cannot miss this part. It is easy for you to check whether you can get deleted notes from your recently deleted folder and you have already known that current data loss will happen without trying the official restore methods. So here we will show you a user's feedback on D-Back which is new to you on iPhone data recovery. Do you get back your deleted notes by the four methods? Don't forget that they all work for the latest iOS 12. If you have other good suggestions about how to recover deleted notes on iPhone, be free to leave us a comment. Hello, I am trying to recover my notes that were deleted. It says it is 100%, but the circle just keeps going around. It’s been like that for the past 20 minutes. Is it still retrieving? Hello Mechillen, which recovery mode did you use? 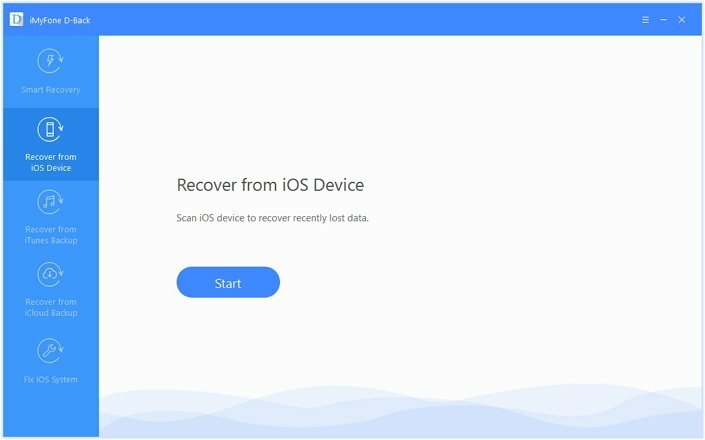 If you have chosen “recover from iOS device” mode, please make sure that your iPhone is connected to your computer by scanning. And please check your network connection as well by using other recovery modes. 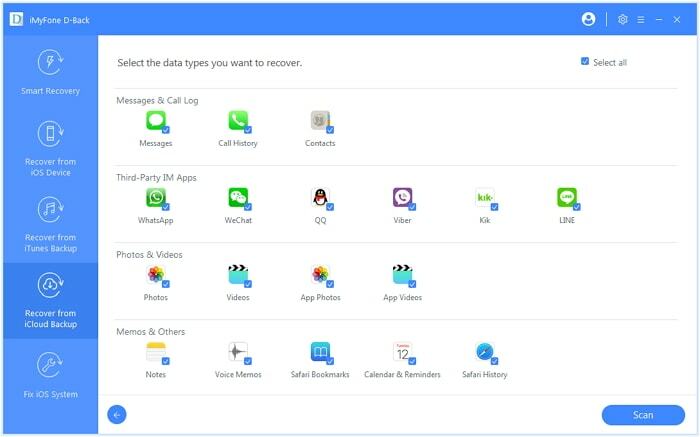 If you still face this issue, please fell free to contact our support team (support@imyfone.com) with the error screenshots or log file, we will try our best to help you solve the problem as soon as possible. This is great! Which of these 4 ways is easiest for a non tech savy person? (like me). Thanks!! Hello Susan, sorry for the late response. You can try the Smart Recovery mode to recover your deleted notes. This mode will intelligently choose the scan and searching routes from your iPhone, iTunes backup or iCloud backup to recover the lost content. Thus, you don’t need to think about any complicated questions! Just run and follow the program with its guide.